AGRL focuses on original applications of geospatial technologies, such as Geographic Information Systems (GIS) and remote sensing to environmental, physical sciences, climate change, social, and health sciences research at national, regional, and local scales. Crime has significant impact on health as crime poses as high health risk to its victims, resulting in substantial demands on health services. However, the impacts from the crime on health are complex and diverse. The idea of spatially investigating the health impact of crime is fairly new. 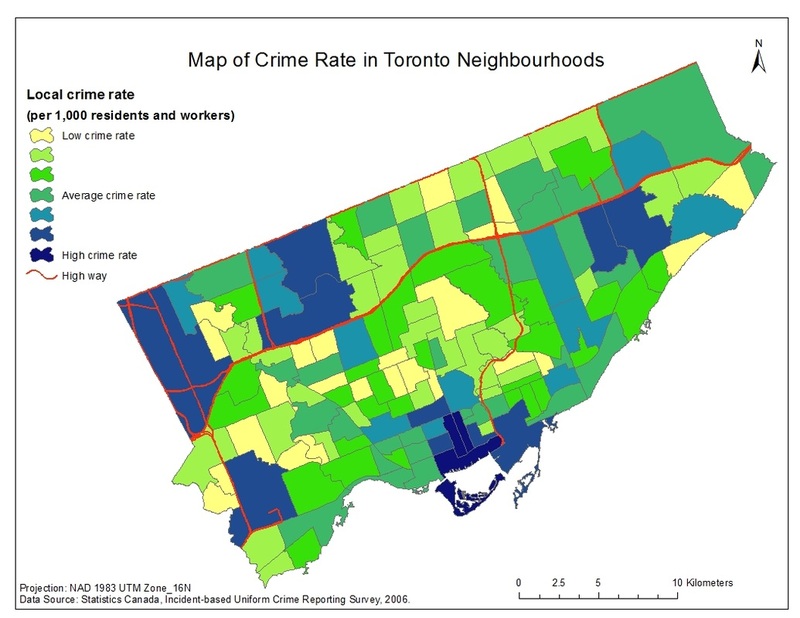 The research aims to explore the spatial associations between crime and public health, and investigate how socioeconomic factors affect the relationship of crime and health in the City of Toronto. An exploratory spatial data analysis approach will be adopted based on the existing aggregated crime statistics, health deprivations, and socioeconomic factors at the neighborhood level. The study also involves an individual scale of analysis by conducting a questionnaire survey to the selected neighborhoods in Toronto with the purpose of exploring how crime affect peoples’ health and quality of life. Findings from the study will contribute to developing effective strategies to crime reduction and prevention, as well as providing information necessary for encouraging service partnerships between health and crime prevention agencies. As the largest carbon reservoir in ecosystems, soil accounts for more than twice as much carbon storage as that of vegetation biomass or the atmosphere. The goal of this study is to examine spatial patterns of soil organic carbon (SOC) in Canadian forest areas on the eco-region scale and to explore its relationship with different ecological variables. 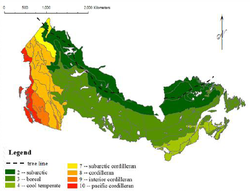 In this study, the first Canadian forest soil database published in 1997 by Canada Forest Service has been analyzed, as well as other long-term eco-climatic data (1961 to 1991) including precipitation, maximum air temperature, NDVI, and elevation. Correlation analysis and exploratory spatial data analysis techniques were applied to assess how SOC patterns vary with respect to ecological variables and ecosystem properties. Findings suggest that although overall SOC content is driven by both climatic and topographic variables, SOC patterns differ significantly among eco-regions. Solar energy replacing conventional non-renewable energy has been widely implemented around the world. Currently, one of the most challenging problems is how to improve the efficacy of producing solar energy. Before installing solar panels, assessing where solar panels should be placed can significantly benefit panel performance. This study aims to conduct a site selection for solar panel installation. Areas such as the main campus of University of Waterloo, farmlands and industry area within the region of Waterloo were selected for the case study analysis. Analysis of solar panel placement in this study was performed at micro and macro scales. The micro-scale analysis focuses on rooftop installations, while the macro-scale analysis studies ground-mounted installation site selection procedures. This study uses Light Detection and Ranging (LIDAR) data to automatically derive incoming solar radiation under clear-sky conditions at different scales and conditions. A multi-criteria analysis approach is adopted for ground-mounted solar panel installation. This study is supplemented by a questionnaire survey distributed to industry partners, gauging common solar panel installation practices. Classification of submerged aquatic vegetation (SAV) in coastal zone mapping is an important aspect of its management, supporting decisions made in spatial marine planning, design and implementation. Remote sensing, which involves the measurement of electromagnetic radiation reflected or emitted from the Earth’s surface is utilized by digital satellite or airborne instrumentation. These technologies assume critical roles in providing this information through the exploitation of spectral energy detected by passive sensors. Airborne hyperspectral imagery (HSI) can be used for creating SAV maps within a relatively small time frame, utilizing endmember extraction algorithms and automated supervised classification methods. The goal of the research is to compare endmember selection methods for seagrass detection, which can then be mapped identifying its spatial coverage and species type.